Resume your journey north to Viridian City. You can't capture new Pokémon just yet, but you can take this opportunity to build your Pokémon's experience levels. If your Pokémon enters too difficult a battle, use the Run command to escape. If it faints, head home to get a little TLC from Mom, or continue onward to Viridian City and enter its Pokémon Center. One time-saving trick is to leap off the low ledges in the ground. You can only jump from a ledge when you're moving down. Be careful not to trap yourself in grassy areas. 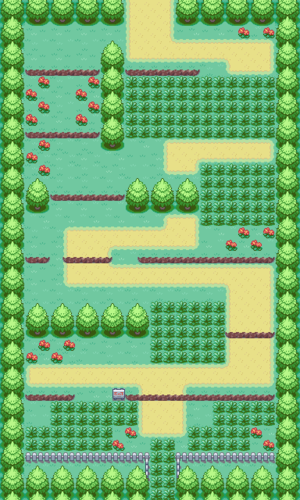 You begin your journey at the bottom of route #1, and must travel north. Route #1 is very peaceful, and doesn't contain many interesting features. As a result, there's not a lot of things to do on your first trip to Viridian City. One of the first people you will encounter is a woman who offers you a free Potion. Don't miss out on that. Wild Pidgeys and Rattatas abound, but without any Poké Balls of your own, the only thing fighting them is good for is EXP. Be careful that they don't wear you down, and stick with your damage-dealing regular attacks. To avoid the fights altogether, spend as little time as possible walking through the grassy areas. They're the only areas where wild Pokémon lurk, so it's the only time you're at risk of being attacked. Pidgeys are probably the single most common Pokémon in the game, so it's not like you'll be hurting for opportunities to catch one. They can be evolved twice and their Flying-type attacks will be very useful for vanquishing the many Bug-types in the Viridian Forest. It's not a bad idea to catch one as your first Flying Pokemon, but you'll probably replace it eventually. These little Rats are all offense... they can't take much more than a hit or two, but they are quick and powerful enough to take down most early enemies before that happens. At level 20, they evolve into stronger Raticate. While you probably won't want to use them forever, Rattatas are quite useful in the early game. This page was last edited on 2 October 2017, at 03:27. This page has been accessed 250,643 times.